Splicing the Mainbrace: Maybe I shouldn't race my house? Tore another sail today. The genoa this time. It was due, though. 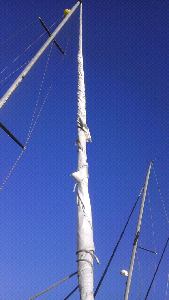 That sail was pushing 25 years old. Happened in the last leg of a race as we were catching up to and getting ready to pass the only yacht ahead of us, a Beneteau 473 (yup, they had five feet of waterline on us). With the genoa in pieces, we continued for a bit on just the main, but there was no way we'd catch them now.